We provide award-winning Winter Gritting Services with an extensive footprint of depots and local teams across Scotland. We understand just how unpredictable and different Scottish weather is, and have consistently delivered "excellent levels of service" year in, year out. For more details see our Google reviews. We offer full liability protection backed up with a guaranteed service which has been tried tested against the toughest of Scottish weather. 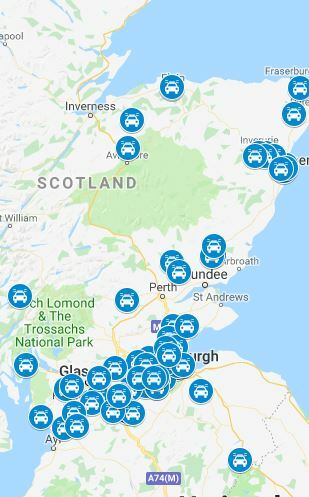 As you can see on the map to the right, our local GRITIT™ teams are available for gritting, de-icing and winter services and cover all of Scotland, including Aberdeenshire, Angus, County of Argyll, Ayrshire, Banffshire, Berwickshire, County of Bute, Caithness, Clackmannanshire, Dumfriesshire, Dunbartonshire, East Lothian, Fife, Inverness-shire, Kincardineshire, Kinross-shire, Kirkcudbrightshire, Lanarkshire, Midlothian, Moray, Nairnshire, Orkney, Peeblesshire, Perthshire, Renfrewshire, Ross & Cromarty, Roxburghshire, Selkirkshire, Shetland, Stirlingshire, Sutherland, West Lothian & Wigtownshire. “Core values of people sent to do the works are very positive – understood the induction, sites values, requirements, behaviours”. “standards of work well, don’t have to micromanage it. Regular team discussions”.